So, you’ve decided to buy a new log cabin. They certainly are a fantastic investment, but, with so much choice available, picking out the perfect cabin can be a daunting task. There are numerous points to consider before parting with your hard-earned cash. 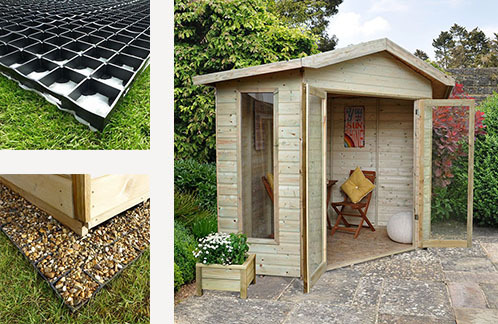 To help you through the tricky process, we’ve put together this simple step-by-step guide, leaving no stone unturned, to make sure you buy the best log cabin for you and your garden. This may be painfully obvious, but available space is going to play a huge part in deciding on the most suitable log cabin to buy. We’d all love an expansive, partitioned garden building comparable in size to a starter home, though unfortunately this isn’t realistic for most of us. Firstly, designate an area you’re able to devote to a log cabin. Secondly, rummage through your drawers until you eventually find a tape measure. Thirdly, calculate the square footage or meterage as yet unoccupied in your garden. Once you’ve ascertained the space you have available, establish common cabin sizes which would comfortably sit within this. Bear in mind orientation too; would a cabin 13’ wide and 10’ long be better for your garden, or vice versa? Picking a size of log cabin is a crucial first step, allowing you to quickly narrow your search. Don’t forget to take into account the fact your cabin will require some space around its perimeter. As most log cabins require annual treating, it’s no use placing your building 3 inches from the garden fence. Two feet of clearance will allow you to coat the walls or give them a lick of paint. You’re standing proudly in front of your newly erected log cabin. It looks majestic. The sun is shining and you’re eagerly anticipating spending many an hour relaxing inside, enjoying the splendid company of friends and family. All of a sudden, your neighbour, like a black cloud emerging over the horizon during a summer barbecue, becomes determined to extinguish your elevated mood. Jealous of your recently acquired garden building, they ferociously complain to the council with preposterous claims about your cabin blocking sunlight, or other such nonsense. To their delight though, and your dismay, your cabin violates a local planning permission law. Obviously, the likelihood of search a scenario developing is extremely slim. Nevertheless, following the old adage ‘it’s better to be safe than sorry’, avoids the heartbreak, frustration and cost of tearing down your beloved log cabin. We do have some useful advice on planning permission here but, as always, if you’re at all worried or concerned about the legality of installing a log cabin on your premises, it’s best to confirm with your local council. Log cabins are ever so versatile; whether you require a garden office since deciding to work from home, wish to pump some iron and pound the treadmill in the privacy of your own space, or simply desire a tranquil garden retreat to relax in, the options are diverse. Once you’ve established the purpose of your log cabin, spend time researching the properties of any products you’re interested in. Will your new log cabin should serve a dual purpose, acting as an office and a storage shed perhaps? Maybe a garage and a summer house? Take time to find a cabin with a structure that works for you; many are multi-faceted, specifically designed to be utilised in two or more ways. Wall log thickness is paramount. For instance, if you’re buying a log cabin to be used as a year-round office or gym, 70mm logs will be far superior to 19mm thanks to the extra insulation they provide. On the other hand, a summer house would not need such thick timbers. Clearly, the thicker timbers result in a more expensive cabin; in this case, the extra money could be spent on additional square footage. Log thickness does not solely refer to walls either; compare roof and floor thicknesses too. A thicker roof will provide much better insulation. A slimmer roof may necessitate the purchase of insulative boards or other products. A thin floor would be unsuitable for heavy gym equipment too, but would comfortably support a desk, chair and other office supplies. Perhaps your log cabin will be used to store summer furniture? If so, double doors will ensure moving chairs, sofas and tables back and forth is a straightforward process. Similarly, windows are vitally important. 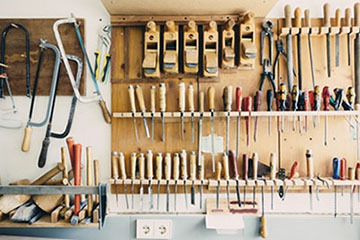 An office or summer house demands an adequate supply of natural light; whereas, if your log cabin is simply a place to securely store tools, abundant windows are unnecessary. Think about double glazing too; double glazed windows will drastically improve insulation. Remember to always install blinds or curtains; you never know when the prying eyes of prowling pilferers could be searching your neighbourhood for carelessly displayed gadgetry. Once the above has been taken into account, it’s time to look at the design of the cabin. Do you prefer a pent or apex roof? Modern or traditional aesthetics? A couple amongst many important questions to ponder. A log cabin shouldn’t be purchased on purely its practicality, but on your style. Furthermore, these garden buildings are designed to stand the test of time; if you’re gazing out of the kitchen window each morning at a building that isn’t a pleasure to see, you probably should have put some more thought into your choice. There are a myriad of different log cabins to choose from. However, even if, despite countless hours spent crawling the web, you still haven’t found your dream garden building, all hope is not lost. A bespoke cabin might be the answer you’re looking for. If you want something completely unique, this route is the one to take. After more time spent searching than you’re willing to admit, you’ve finally decided which log cabin to buy. It’s stunning, ticking all the boxes. Exactly what you’re looking for. The task is not quite complete yet; don’t rest on your laurels. Your log cabin needs a base. A solid, level base is an absolute necessity. While paving slabs and decking would be suitable for smaller cabins, larger garden buildings should be placed onto thick concrete. We’d recommend 80-100mm. Don’t scrimp here, use credible contractors. The prettiest log cabin in the world will soon lose those good looks if it starts to subside. Nowadays, concrete isn’t the only option. A competitor has arisen, in the form of plastic grids. Much cheaper than their concrete counterparts, plastic bases are now a viable option. Though fantastically strong, due care and attention must always be given to ensure they’re installed correctly; else, if instructions are not adhered too, they could cause problems. Base already firmly in place, log cabin selected and ready to order, thoughts must now turn to building the beast. If you’re DIY-competent, and have a couple of willing friends, set aside a weekend to construct your cabin. Though instructions are simple to follow, sizeable, heavy components are many; this task will be time consuming. Nevertheless, if you’re up for the challenge, the satisfaction of a job well done will fill you with pride. On the contrary, if you’re like me, and possess no DIY skills whatsoever, opting for a professional installation is definitely a better option. Rather than asking questions like ‘where does this thing go?’, ‘what’s this?’, and ‘how has that happened?’, with accompanying expletives, why not kick back, relax, and let the experts handle everything? After all, they build these cabins every day; their DIY knowledge extends far beyond struggling with flat pack furniture. One factor yet to consider in buying a log cabin is, of course, budget. Crusher of many a home improvement dream, sticking within a budget is crucial. It’s no good having a beautiful log cabin, professionally erected, sitting resplendent on a heavy-duty concrete base, if you can’t afford your weekly food shop. The purchase of a log cabin should be carefully considered to avoid overspending and the stress this could cause. Once you’ve added together the cost of the garden building itself, the installation thereof and the base, the overall figure may seem a little eye-watering. Rather than see such a large amount of money suddenly removed from your account, interest free credit options spread payments over a three month period, an incredibly useful service well worth exploring. Only once all of the above have been considered, are you ready to buy a new log cabin. The decision is not to be taken lightly, log cabins are the largest purchase you’re likely to make for your garden, taking up space and changing its whole appearance. These are but small sacrifices though, when you consider the possibilities: massively increased productivity for those working from home, countless hours spent relaxing with family and friends, fitness and health dramatically improved in your own personal gym. If, despite this guide, you’re still unsure of which cabin is best for you, or just want to talk through some options with an expert, please don’t hesitate to give us a call, on 0333 003 0517. Our friendly, UK-based, call centre staff will be delighted to offer their advice and lend a helping hand.